it should be peace of mind as well. The new iVision achieves both by giving you the ability to not only know when somebody is outside your home, but to view and talk to them from the safety and comfort of any location in the house. The iVision package includes a convenient hand-held wireless receiver with 2.25″ LCD monitor and battery operated doorbell/camera unit with over 300ft. transmission range. 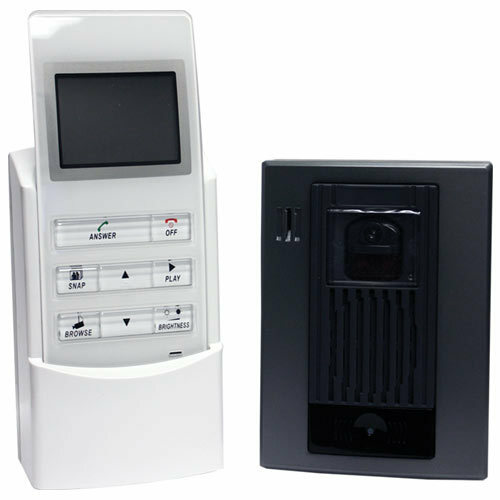 In addition, the doorbell/camera unit can be hardwired into existing doorbell power supply to allow the user to utilize a “browse” feature on the handheld unit. This feature allows the user to monitor the view from the doorbell/camera unit on the LCD display.